As I settle back into life in Qatar after being in Shanghai the full realisation of the power and potential that is Learning 2.008 dominates my thinking on this final sharing and reflection blog post. 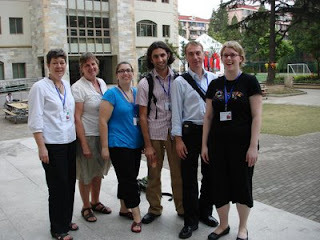 Under the direction of Jeff Utecht and the team of organisers, including the hard-working Flat Classroom colleague Simon May, the event, hosted by the Shanghai Community International School attracted over 500 participants from as far afield as Australia, Canada, the Middle East, and many regional Asian countries. 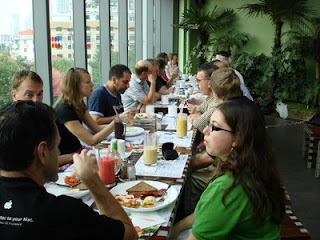 Our first get together was at the restaurant Elements Fresh where a small but vibrant 'EdubloggerCon' took place. Here we discussed how to make the shift happen in schools and heard from classroom teachers, coordinators, librarians and others telling their stories of Web 2.0 adoption. I took some excellent video footage of participants talking about their tipping point into education, international education and into making a difference that I have yet to edit and publish...stay tuned for this as it will be good! I had a lot of fun with friends Kim Cofino, Chrissy Hellyer, (both at International School Bangkok) and Tod Baker (Tianjin International School). As conference presenters (green dot and blue dot) we banded together, agonized over our presentations, sought each others opinion and support about length, image source, presentation style, room facilities etc etc. We were a great team and I value the friendship and collegiality. "International School teachers are a fascinating, vibrant set of digital citizens; forsaking the norms of western life to teach in places like New Delhi, Saigon, Bangkok. It was fun to see them struggle to answer the question, “So where are you from?” as it has many layers. Living far from family, they are really wired in terms of communication technologies, but seem to struggle like teachers all over with how to integrate the flood of new technologies in their teaching." "The participants of this conference, by their presence alone proved that we are a group of diverse educators determined to find better ways to learn. No one truly knows the secret answer, because there is no secret answer. We, and I say we with pride because I learned that I too have ideas to offer, are simply trying to find ways to educate children as best we can. Technology is not the answer. It really doesn’t have much to do with technology at all. It has to do with community and the sharing of knowledge and ideas!" One of the best outcomes of Learning 2.008 was seeing the 3 teachers from my school here in Qatar attend and participate and marvel at how much there was to do and learn. "I had a very enjoyable conference. I learnt so much! It was very inspiring and a real privilege to attend. Are you able to inform me when there are any conferences being offered similar to this one. I would like to attend a PD like this yearly and I would pay for it myself cause I think it is so worthwhile. I can’t wait to get my children involved in all this wonderful IT material available to them and to me." As a side-trip in a brief escape from the conference I was on a mission to buy a tenor saxophone for my daughter. 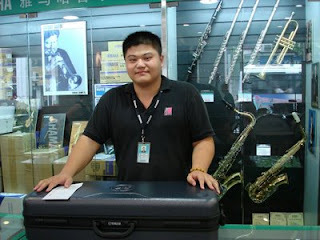 Armed with a map and determination I found my way to Best Friend music, the Yamaha dealer recommended in a road not far from Nanjing Road. There I ordered the saxophone, was escorted to the nearest bank by the friendly shop assistant (photo below), and went back just before flying out to pick it up. I took this photo as a souvenir of my efforts. So, for me Learning 2.008 was a mixture of hard work, good fun, exciting travel experiences, collegiality and continued community building with educators who I continue to learn from everyday. With its combination of presentation sessions and 'unconference' sessions it provided opportunities for people to share experiences and best practice at difference levels and fostered ongoing conversations and debate about where we have come from and where we are going. It is a model that other international gatherings could look at emulating in some form. 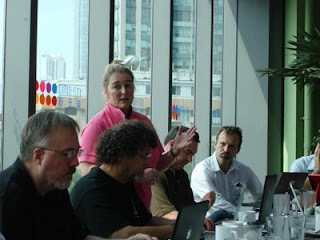 As I continue to plan for our event here in Doha in January, the Flat Classroom Conference, I am taking on board ideas that include fostering social learning and providing time for casual gatherings that are focused on what the participants want to talk about, not only what the presenters want to present. Like you, I felt that I had made a friend, and a fellow Melbournite at that! I truly believe your great work should have been given greater prominence at the conference. I would love to have the opportunity to work with you on collaborative projects and anticipate what might be. It was such a treat to meet you Julie! The work you do and share exemplify best of the best practices in education, and we at the NMC are just ecstatic about the research the kids in your project provide. sounds like a ton of fun. i am jealous. 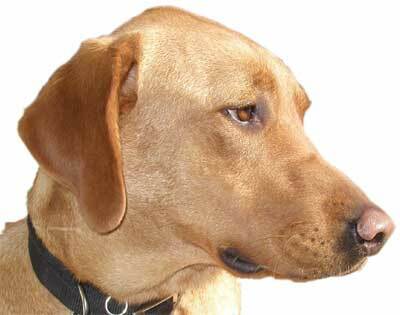 I want to start by thanking you for not only reading my post, but taking the time to quote and link to it. After the conference I am feeling much more connected than I did before. I am not sure if this is because I actively writing and commenting more, or because I can now put a face and a personality to many of the people I follow online, whatever may be the case I am glad to have this rejuvenated sense of community. This reflection on community building is one of my min points of interests this year. It is one thing to be involved in a network, but how do we create meaningful, lasting relationships? As our professional relationship matures, I hope we will start to build on our friendship as well. 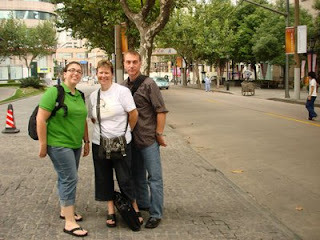 I enjoyed the sessions you presented as well as the time we spent out and about in Shanghai. It is a shame we cannot work together in the same building, but I look forward to working with you in some facet soon. As usual, it was such a pleasure to spend the long weekend with you Julie! It has been such a pleasure to get to know you in person over the course of the last two years - I feel so lucky to be working closely enough (geographically speaking) to be able to connect like this, face-to-face with some regularity. 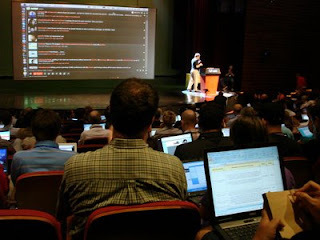 I definitely think there's something to the personal, face-to-face, connection you make at these conferences. I truly believe in the power of the network, but once you are able to make the connection of the mind that you read and connect with online, to the whole person that you meet at conferences like this one, I think you are able to take that friendship and collegiality to the next level. We're lucky that we get to do this so often!